Gary had to go to Florida for a week, so we reluctantly went with him. 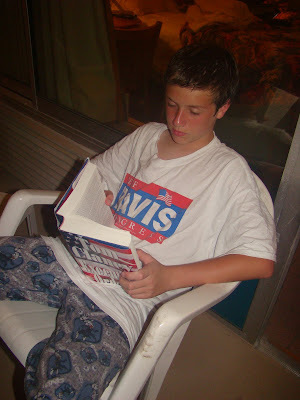 While Gabriel was in North Carolina with Gary in July, he discovered Tom Clancy. This is how he spent much of his time at the room- out on the balcony reading. Dominic, on the other hand, has decided to persue a career as a barista. My only concern is his penchant for putting things that make your mouth burn in his drinks. Xavier wanted to spend all day at the pool or beach. Dominic really hates getting his face wet. 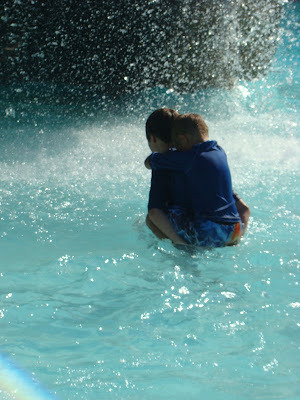 Here, Gabriel takes him in hand and helps him overcome the waterfall. By the end of the trip, Dominic managed to do it himself. 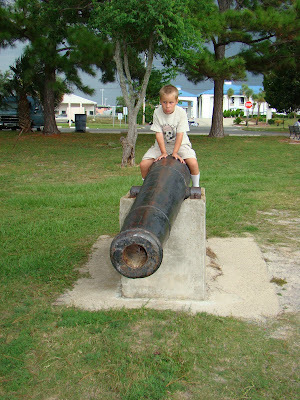 And, he rode a cannon.